All of these transition metal-centered boron wheels M©Bn-/0  were designed on the basis of geometric and electronic fit principles. The design was inspired by the structure and chemical bonding of the first all-boron wheel, B9-, discovered earlier . 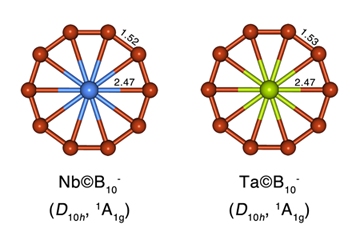 The global minimum structure of the B9- cluster is a D8h wheel-type structure, B©B8-, consisting of an octacoordinate central boron atom surrounded by a ring of eight boron atoms. The peripheral atoms are bonded to each other by 2c-2e σ bonds, and the central atom is bound to the outer ring by 3 delocalized σ and 3 delocalized π bonds. The numbers of delocalized σ and π electrons (6 of each) satisfy the 4N+2 Hückel rule for aromaticity. Thus, the cluster is doubly (σ and π) aromatic leading to the high symmetry, planarity and stability of the wheel type structure over alternative isomers. The electronic principle for designing an M(x)©Bnk- transition metal-centered boron wheel requires that the total number of bonding electrons ensures formation of n 2c-2e bonds on the circumference of the cluster and two sets (σ and π) of delocalized bonds satisfying Hückel’s rule separately for σ and π electrons. Thus, the formal valency of the metal (x), number of boron atoms (n) and the negative charge (k) should satisfy x + n + k = (4Nσ + 2) + (4Nπ + 2) . The following chemical bonding elements were obtained for Co©B8-: three lone pairs on the Co atom, eight 2c-2e σ bonds between every pair of the boron atoms, three totally delocalized σ and three totally delocalized π bonds. Out of the total of 9 valence electrons of the Co atom, 6 form lone pairs and 3 are bonding. Thus, the above equation is satisfied with x = 3, n = 8, k = 1 and Nσ = Nπ = 1, as is Hückel’s rule for σ and π aromaticity. In the case of Ta©B10-, no lone pairs on the central atom, ten 2c-2e σ bonds, three delocalized π and 5 delocalized σ bonds were revealed in the analysis. Thus, in this case we have 6 delocalized π electrons (Hückel’s 4Nπ + 2 rule with Nπ = 1) and 10 delocalized σ electrons (Hückel’s 4Nσ + 2 rule with Nσ = 2) and the cluster is also doubly aromatic. Ta has the formal oxidation state +5 (all the valence electrons participate in the bonding) and the electronic principle is satisfied with x = 5, n = 10, k = 1, Nπ = 1, and Nσ = 2. In summary, the transition metal centered boron molecular wheels represent a new class of aromatic species that have been rationally designed based on simple chemical bonding model and observed in a molecular beam and might potentailly be obtained in condensed phase as ligands or building blocks of complex compounds and new materials.